Fly-tipping is the illegal dumping of waste on public land or in water. The waste is usually dumped to avoid disposal costs. Your rubbish can be traced back to you: choose a removal company that you can trust to make sure your waste is disposed of correctly. 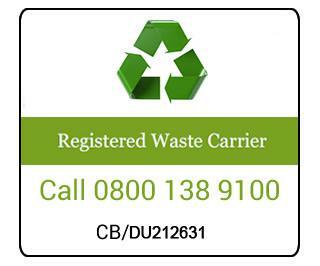 Rubbish Clearance is fully licensed waste carrier and registered with the Environment Agency. We guarantee legal and safe disposal of all household waste. Find out how we are environmentally friendly. Call 0800 138 9100 for a free quote – prices start from just £40. It used to be free to dump construction waste from a home at the local tip. However, many local Councils are now introducing charges for non-household waste which is any waste from DIY projects and home renovations like bags of rubble, plasterboard and soil. Choose Rubbish Clearance Ltd.
With charges at around £2.50 per bag, the costs can quickly add up! Hire our waste removal service and let us do the hard work for you! Our fast and friendly two man teams will come and collect your junk and waste materials seven days a week. Click here for a quote or to book your collection service. If you have been targeted by fly tippers dumping waste on your land, contact us to book a time to come and remove it. We have specialist vehicles and efficient teams in your local area. Let us clear your site for you. Rubbish Clearance Ltd is one of London and the South East's best known Waste Removal and Recycling Companies. Whatever your rubbish disposal or waste recycling needs, Rubbish Clearance Ltd can provide an efficient and cost effective service across London, Essex and Berkshire.